Hope you had a wonderful Thanksgiving. 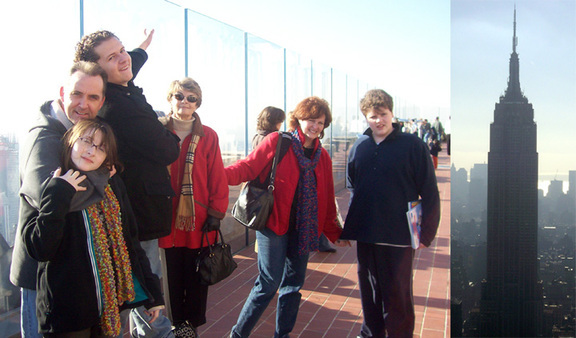 My parents came from Minnesota and we had an action packed weekend. Even made them come to the Hard Rock Cafe at Times Square following a day in the city and a visit to the Top of the Rock. They'll probably die that I'm showing you these pictures....no they won't, they'd expect that from me. The new clear stamps have arrived! They are so much fun to play with. 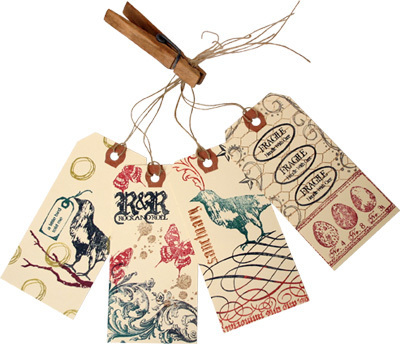 These stamped tags are done by our own favorite Editor, and Director of Publishing at Stampington & Co., Jenny Doh! She created some cool pieces don't you think? She knows me well....look what her title is for the instruction segment for these in the Stampington online Studio, HERE. How Cool is That? Shuffle over to my Street Team site and see the One Day Give-Away I announced. Winner will receive the Rock&Roll clear set of rubber. Thanks Jenny, for sharing your art! It started with a linens set to go with our new red painted bedroom. Then I found ONE plate....started using it everyday for breakfast. Months later I found a fun mug in red. 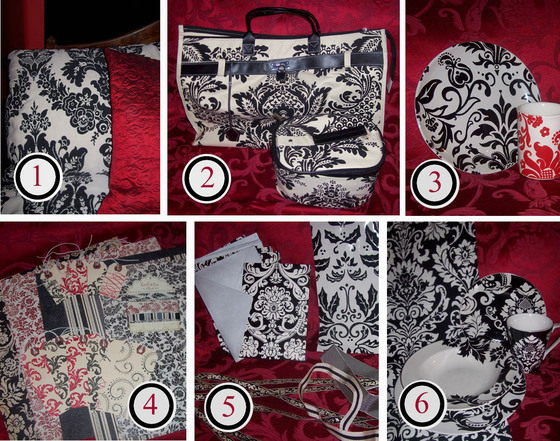 To follow were many other items with this favorite black and white damask pattern. How cool is that when something you love spills over into all the areas of your life? I even have a great brocade jacket with this pattern in red and black, and a black wool coat with ivory embroidered flourishes. Can't get enough of this look, can you tell? 1. Bed cover and shams, found at TJ Maxx. 3. Plate and mug, found at TJ Maxx. 4. 12" paper and ribbon by Foofala at 2Peas, stamped tags with Clearly Impressed stamps at Stampington & Co.
5. Folded notecards and wrapping paper from Target, ribbons from MJ Trimmings. 6. Table runner and dinner set from Target. 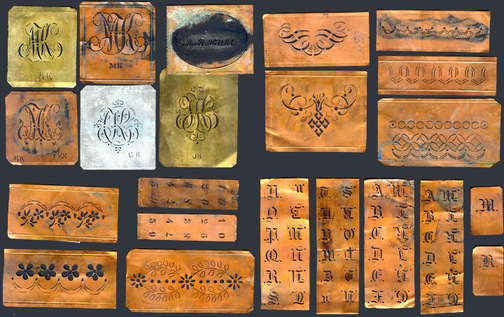 I wish you could see and feel these old copper stencils. They are paper thin....like almost thinner than paper. 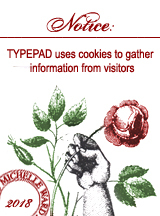 I've been collecting alphabet stencils, of all kinds, for years. I mostly like whole alphabets, like the plastic stencils for wall art. But I also love monograms, and anything "M" or "W". How cool is it that an M upside-down is a W? Love that. Here, there are several "MK"s, which was an added bonus since that is my maiden name monogram, and the initials of my three nieces. I bought these without really knowing what I was getting (through ebay) and was pleasantly surprised. Also included in the little treasure box were three vintage stubby stencil brushes, very used, which I love. Someone held these, used these, loved these. There were some bits of old paper that must have been used to test out the stencils prior to marking them into place with carbon. Evidence that an artist was at work. Now it's all mine, having traveled overseas from England, and someone has a few more pounds in their pocket. It's not an everyday occurrance where you hear your town's name in the same sentence as the Empire State Building. However, if you happen to live in Piscataway, New Jersey, home of Rutgers University, you heard it on the news tonight. The lights went RED for the Scarlet Knights. I can't say we are huge college football fans here but you can't help but catch the fever when it's in your own home town, the team is undefeated, and you get a recorded message from the local police to stay off certain roads due to game traffic....and those roads are the only ones you take to get to your home. Very exciting.....and we won! 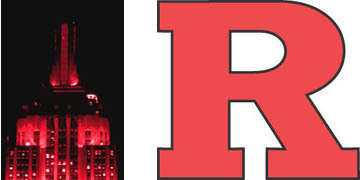 Bit of trivia - first intercollegiate football game ever played was at Rutgers in 1869. Fallon and I had a day in the city Friday. Our first stop was to see the windows at Bergdorf. 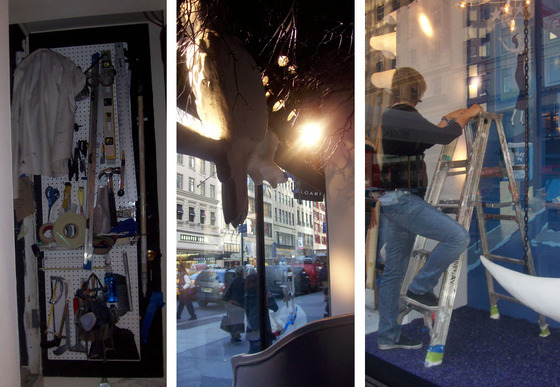 We make a trek there each Christmas just for window watching at all the big stores, but this year we went in early to catch the final days of Bergdorf's "Gothic Splendor" windows, as inspired by the House and Garden article in the Nov 06 issue. Douglas Little, of D.L. 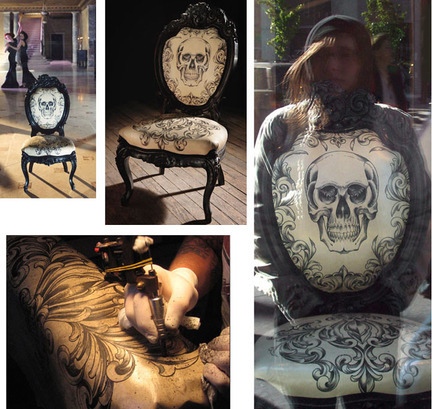 & Co. collaborated with Linda Fargo on these windows - his gothic curiosities in each display. It was a real treat to get this close to such magnificence. Here's another shot from the magazine article. This scene was re-enacted in the windows with a painted staircase and mannequins. The spider web chandelier was to die for, made of silver chain and Swarovski crystals. Of course I couldn't get a good photo of it during the day - I'm sure it was lovely in the evening.....but we couldn't hang around....we had more stuff to do! Before we headed off, we had a quick run through the store....Fallon was in Project Runway Wannabe Heaven when we landed on the floor with the couture evening gowns. You know the department you would normally just pass by, knowing the lady at the desk would size you up and wonder what you were doing there? Well, that kind of thing doesn't phase an 11 year old. In we went.....dreamily looking at and touching dresses that sell for $11,000 plus. I admit, it was so very special to see the dresses through her eyes. I think there is a Cinderella in all of us, no matter what our age. As we were leaving out a side door of Bergdorf's we caught a sight that I have never experienced. The magic doors that lead to the windows were open. These side windows were in the process of getting their winter window dressings. There on the door were the tools of the worker bee. This one window was uninhabited.....some minimal props had been set in place, including a little loveseat.....it was really just asking to be sat in. I was dying to have a seat in the window.....but I knew Fallon was too much of a chicken to go out on the street and take the picture of me sitting there. Would have been great though don't you think? This last shot shows a gal continuing the process. Since we only go to New York to see the holiday windows in December I have never witnessed them being put up. It was cool. My first visit to a Hard Rock Cafe was in 1984, London. That was the original one....now there are over 100. We took our kids to their first one in Niagara Falls, Canada. Yesterday, Fallon and I went to the new one at Times Square. It's huge! And there's a stage! We sat near Ace's guitar - pretty cool as we are KISS fans. Gotta love the fork sign....it's giving the rock and roll fingers! I think I may bend a few myself. 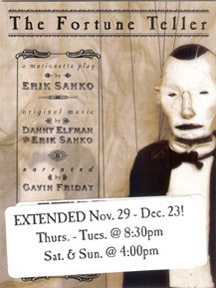 Last stop was the HERE theater so see the marionette show, The Fortune Teller, by *Erik Sanko. (Got the heads up on this event from my friend Lynne.) My daughter has been to Lincoln Center, Radio City Music Hall, and several Broadway shows......so this was a bit of a departure but I knew she'd love it. You couldn't see an authentic marionette show in anything larger than the HERE theater. When you get there, you show your ticket to the guy at the ticket counter, that doubles as a refreshement stand. He actually crosses Your Name off his list and hands you a program. You sit in a small holding room on random bits of living room furniture. When the guy announces the doors are open you leave the room, out the doors, follow the red tape along the sidewalk, enter another set of doors, keep following the red tape, down a stairwell, around the corner and into the performance room. The stage is set with a building front at 1/3 real life scale. The lighting and music set the eery tone. The people shuffle in.....less than 100. It is a fantastic show. The marionettes are clever and gothy and works of art themselves. The narrative is provided by the perfect British voice as he unravels the tale, music provided by Danny Elfman (yes, of Nightmare fame). The old house is the ultimate stage....the door opens, then later a front panel raises to show us the dining parlor with the full cast of characters. There are two side sections that not only open, but mechanically move forward to illuminate a detail within the story. Several times we saw the hands that hold the puppets - a reminder that these were just a couple of guys behind the scenes working their magic. As you can see from this card, there is a sticker updating the schedule, with more dates added for December. Go if you can! A GREAT DAY IN GOTHAM CITY. By tomorrow night Fallon's memories will be upstaged by the Guns N Roses concert she and my husband are going to - but I'll remember this day forever. *Erik Sanko is a musician with Skeleton Key and has been with several other bands. 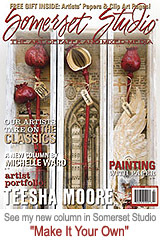 His wife is an assemblage artist, Jessica Grindstaff. In a review I read of a collaborative show they did (Marionettes and Music Boxes) they were described as "Cut from the same cloth, hatched from the same egg, they are the illegitimate love children of Tim Burton and Joseph Cornell. In a sea of papier-mache and wood, taxidermy and music, gravity and motion, here are the shining, dust covered examples of a couple of esoterics indulging their idiosyncracies."